Medill Prof. Patty Loew. Loew is creating a tour of Northwestern and Evanston to educate students and Evanston community members about the area’s indigenous people. Walking along the Northwestern lakefront, it’s hard to imagine anything other than students and University buildings coloring the backdrop. But centuries ago, the Three Fires Confederacy — made up of Ojibwe, Potawatomi, and Odawa people — ceded this same land to Northwestern. This is something Medill professor Patty Loew is determined to make known. Joined by a team of students and faculty, Loew is creating the first Indigenous Tour of NU. She said it’s a walking tour with some virtual reality elements that “is sure to become a part of the University’s legacy.” At each physical stop on campus and in Evanston, student-created multimedia components, along with original historical documents, videos and recordings, will be viewable on a smartphone. Loew said she was already planning the project when she became a Northwestern faculty member in 2017. Her idea became a reality after receiving the 2019 Daniel I. Linzer Grant for Innovation in Diversity and Equity, which gave her $20,000 to start working on the virtual tour. Loew said the purpose of the tour is to educate students, staff and visitors about indigenous history, as well as to promote a sense of connectedness within the NU community. The tour’s creation aims to address a few of the 56 recommendations to “strengthen NU’s relationship with Native American and indigenous communities,” as stated in a report by NU’s Native American Outreach and Inclusion Task Force in November 2014. The recommendations were made in response to two 2014 reports, one by NU in May and one by the University of Denver in November, about the role John Evans — one of NU’s founders and the territorial governor of Colorado during the mid-19th century — played in the Sand Creek Massacre. “NU has positioned Native studies as a priority in its diversity and inclusion plan,” Loew said. Planned locations on the tour include the James L. Allen Center and its Inuit art collection as well as the Charles Deering McCormick Library of Special Collections, where a portrait of the Sauk War Chief Black Hawk hangs. Medill sophomore Carlyn Kranking is in Loew’s class and said she has already learned a lot about indigenous people and their relationship with NU. During Spring Quarter, Communication lecturer Dr. Stephan Moore will work with the Knight Lab on technology details of the tour. Moore will oversee two Radio, Television and Film graduate interns who will create the soundscape for the tour. The tour is set to be released in time for Indigenous Peoples Day on October 14, 2019. 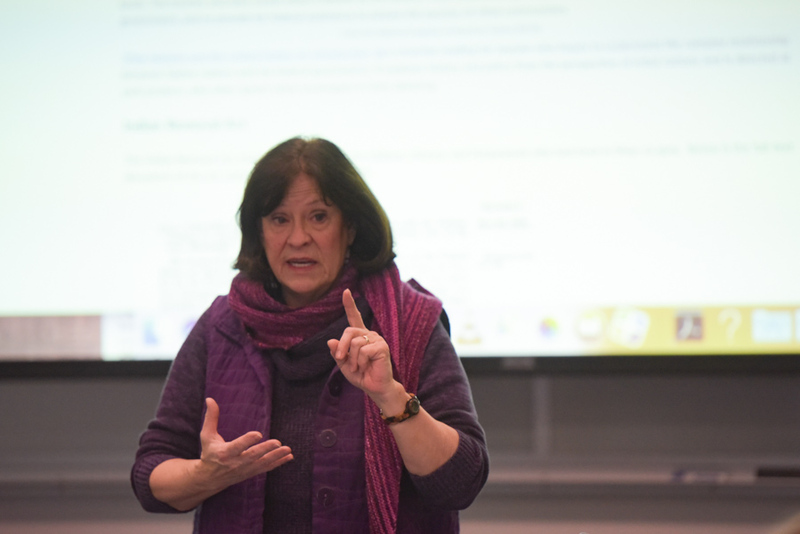 Additionally, Loew said she and Jennifer Michals, a program assistant at the Center for Native American and Indigenous Research, will create a lesson plan and teachers guide for Evanston schools to use with its students. “The tour is an opportunity to reclaim our voices and identity, to share of our communities presence and history, about and on our homelands, in our own voices,” Michals told The Daily in an email. With the help of her students and colleagues, Loew looks forward to telling indigenous people’s untold stories. “In all my years as a professor, I have never been so excited about teaching,” said Loew.